Let’s just cut to the chase. I can say without any reservation that Day of the Dead 2: Contagium is simply a great movie. For Thermos. In order to fully comprehend the role that Thermos Brand Insulated Products play in the film, a little history is in order. It was way back in 1892 that James Dewar first invented the technology that would later become known throughout the world as Thermos Brand Insulated Products. Then in 1968 at a research facility in Pennsylvania, some special zombie research material was smuggled out in a green Thermos and was lost in a ravine nearby. Forty-seven years later, the Thermos is discovered and by God if James Dewar’s invention turns out to be the little vacuum flask that could! That sucker is still sealed up good and tight! Well, once the Thermos Brand Insulated Products infomercial part of this movie is finished, things start going more sour than milk in a Thermos Brand Insulated Products knock-off made in Belize. First of all, this movie has nothing to do with the first Day Of The Dead. In fact, the only relation it has to any of those Dead or Living Dead movies is that the prologue takes place in Pennsylvania in 1968. Because, you know, Night of the Living Dead came out in 1968 and was set in Pennsylvania. The movie though doesn’t even make good use of its prologue because it annoyingly chooses to reveal more of the backstory through some flashbacks later on in the movie. It might not have been so annoying if the backstory wasn’t so stupid and if the flashbacks actually revealed anything important to the current story. Back in 1968, a Russian spy plane crashes out west and the pilot and some mysterious vials are recovered and brought to the research facility. The Russian fiddles with the vials and they open up and some badly animated bubbles come out and infect him. Next thing you know he’s biting a guy and the facility has to be blown up, but not before a green Thermos Brand Insulated Product with one of the vials inside gets dumped in a nearby ravine. The best part of all this is that this is one of those movies that starts out stupid and gets progressively worse. Guess who finds the Thermos in the present day? A patient from the nearby mental hospital! Nothing draws me into a story more than the trials and tribulations of crazy idiots. So you built your mental hospital right near the ruins of the research facility that got overrun by zombies? Were all the good ancient Indian burial grounds taken? The Thermos is obviously opened and a group of patients and their doctor get exposed to the zombie gas. Of course this happens only after you’ve been watching this wretched movie for about four days. I’m not sure what the filmmakers were up to when they were busy detailing daily life at the mental hospital. Guess what? I don’t care! 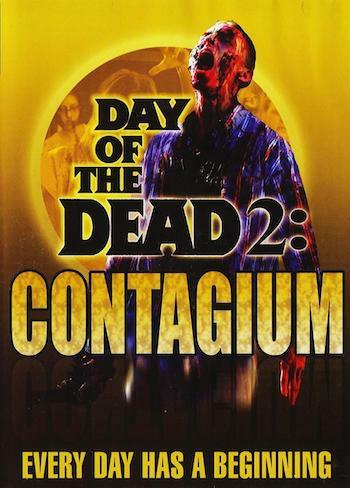 Your horrible movie is called Day of the Dead 2: Contagium, not One Flew Over the Cuckoo’s Nest! But this movie is so bad that even as it bores you into having your own mental problems, like a big piece of movie roadkill, it actually gets stinkier and more bloated with its own lameness as it lays there. Once our cast of uninteresting characters gets infected, they start to have peeling skin, puke black gunk up, and develop telepathy. They can even feel each other’s pain and they also reflect each other’s wounds! Well, sometimes they do. The movie periodically forgets these various superpowers now and again. There’s also some babble about an antidote and how the bad guy doctor knew all along about this, but so what? The antidote is never used, the doctor gets killed and the Thermos was lost for almost fifty years! Thanks to the long slow stretches in the middle of the movie this won’t even make it to that coveted “so bad it’s good” territory that seems to be awarded to crappy movies like some sort of hipster consolation prize. Pathetic on every level, the only attention this thing will get is solely because of its title which I’m sure the crass cash-in types behind this intended all along. The stupidity of it all will leave you reeling. But I may be getting myself a Thermos. Holy crap, I had completely forgotten about this movie! The original Day of the Dead is more an “experiencie” than a movie for me, because the particular circumstances I ended up watching the flick. So even if it’s not very good, it’s not too bad either. However, THIS flick is astonishingly bad. I read somewhere that ended up being filmed because someone managed to acquire the rights to “Day of…” cheap, since the original movie wasn’t very hot. When the zombie trend started to revive, they decided to cash in Romero’s “fame” (as it was, he managed to destroy his reputation very quickly with a number of ill-conceived “Dead” movies) and released this POS. I vaguely remember some kind of totally uninteresting romance between the lead guy and a short haired girl, and how both died in the end. On one hand, kudos to these guys for trying to give the movie a -somewhat- different context. On the other, why couldn’t they think of a better plot? There is nothing cheaper than imagination. There was an even worse Romero-related zombie project that came out in 2005 – the Land of the Dead: Road to Fiddler’s Green video game. Ah, yes! I’m ashamed to admit that I actually played the game, all through the end! (how pathetic is that?) I recall they had more no more than four or five different zombies, and barely any voice acting, since most of the dialogue was a monologue voice-over by the protagonist. Not THAT bad, either, but very, very disappointing for a commercial tie-in with a more or less expected movie as Land of The Dead.